Last year, I posted my first Range vs. Temperature report after the first winter with our Leaf. As the temperature dropped, you could clearly see a trend going down in terms of range, from about 140 Km in the summer, to 80 Km in the winter. We had a fairly mild winter for Canadian standards that year, and I happened to be away on vacation during the coldest days. As a result, I only had a few trips under very low temperatures and the lowest I was able to record was “only” -22C (-8F), and without enough trips to create a good average. The second issue was that I didn’t know the car very well and I used the cabin heater a lot. As a result, I ended up not having enough data to show how much effect cabin heating would have on range. So the drop in estimated range was fairly significant as you can see below. Last winter, I decided to make an experiment to test my hypothesis that cabin heating, not outside temperature, is the main factor affecting range in the winter. As the temperature dropped in January, I decided to take one for the team and drive with minimal cabin heating as much as possible, relying mostly on the heated seats, heated steering wheel and a good winter jacket. I also pre-heated the car before each trip, trying to simulate what I would normally do on a long trip. Pre-heating the car means charging for 20 to 30 mins before each trip and also pre-heating the cabin for at least 15 minutes while still plugged in. This procedure heats up the coolant used by the heating system, using grid power instead of battery power. The estimated range is based on 120 V charging times. I didn’t use the FleetCarma data because I wanted to compare the results with the original baseline from the first winter, which I created before having the data logger. By comparing the two charts side-by-side, you can clearly see that I was able to consistently get at least 100 Km of an estimated range and bring the trend line to a flat line, regardless of the outside temperature. These results confirmed my expectations but I still find it quite impressive. It is as if the battery didn’t care about the outside temperature as long as its own internal temperature was fine. The fact that you’re either charging or driving the car maintains a flow of electrons in and out of the battery which is enough to generate enough heat to keep the battery chemistry warm. The real challenge is how to keep yourself warm, and any passengers you might have. I only had two trips recorded with temperatures below -23C, but I had to use the cabin heater in both occasions (freezing to death has its limit). One trip was at -25C (94 km range) and the other at -27C (74 km range). For the latter, the thermometer outside the house actually said -29C but I used the car thermometer as a more consistent reference. I added these two data points to the graph below to illustrate that the flatness of the curve breaks down, closer to last year’s trend, the moment you turn on the heater. One thing these results show is that the cabin heater in the 2011 model is very inefficient. There is hope the 2013 will perform better but it is yet to be tested under the deep freeze (some people expect the performance to be the same when the temperature falls below -10 C). Some LEAF owners have been successful in installing an internal ceramic heater in the cabin that performs much better than the regular heater. It is also possible to carry a separate 12 V to power that ceramic heater. With such auxiliary heating system in place, I would be very confident that the Leaf could drive 100 km in one charge in the winter regardless of the outside temperature. With winter quickly approaching, we’ve been getting a lot of questions about how the Leaf performs under deep freezing temperatures. Our Leaf already has two Ottawa winters under its belt and we’re getting ready for its third one without a lot of concerns since we pretty much know exactly what the car can and cannot do. So this is how I can summarize our experience with Leaf in the winter so far. Range definitely drops but how much it drops mainly depends on how much you use the cabin heater, not necessarily on the outside temperature. If you heat up the cabin like a furnace and drive like there is no tomorrow, your typical 140 km range can easily drop all the way down to 60 km or even less. But if you manage to keep your cabin cool, drive conservatively, and use some of the techniques described below, you can still drive 100 km under fairly low temperatures. With a short commute like mine (17 to 29 km each way), winter range is rarely a concern. However, if I need to run some errands in the evening, I do need to top off the charge during supper. To me, that’s main difference between summer and winter. In the summer, I rarely need to charge during the day. During the weekends, most of our driving is spread out during the course of the day, with many opportunities to recharge at home. For longer than usual winter drives, we take our range extender (my wife’s car). Heavy snow fall increases rolling resistance, and heavy freezing rain requires you to run the windshield defrost most of the time. I find these two conditions actually worse than a bone chilling but sunny day. There are several techniques you can use to minimize the use of the cabin heater. It is essential to pre-heat the car before you leave, using grid power, and take advantage of the heated seats and heated steering wheels, and keep your winter jacket on. The 2013 model has a more efficient cabin heater that is expected to perform better than the one that I have, but its performance is yet to be tested under very low temperatures. Range concerns aside, the Leaf is the most comfortable car I’ve ever had in the winter. The extra weight from the batteries and the traction control system make it very safe to drive under heavy snow and slush conditions. It doesn’t have any problem “starting” in the cold, or that heavy and sluggish feeling of a gas car in the winter. All the energy I spend driving to work is easily recovered during the work hours, so any concern about range only starts after 5 PM. Charging at work keeps the battery warm during the day, improving the car performance during the drive back home. I’m able to continue to charge to 80%, at home and at work, which increases the longevity of the battery pack. Without it, I would probably need to charge to 100% at home every night. I hope this helps anyone considering buying a Leaf but is still concerned about driving it in the winter. Great and thoughtful post about Leaf range performance in our Canadian winter cold. Thanks for the info. Nice ice fishing pic! It’s nice to get a Canadian perspective. I live in the maritimes and the nissan dealers do not have any Leafs to test drive. Thankfully I will be in Ottawa to visit family in Nov and hope to test drive a leaf. Do you have any experience/dealings with the Hunt Club Nissan dealer? I drive a 06 Prius and my wife has 2yrs left on a Honda Civic lease, would love to replace with a Leaf! My sister in law in Barhaven has a 10yrs old Toyota Matrix and it would make so much sense to replace with a Leaf/$8500 rebate. In Moncton we have a Suncountry Hwy charger at an Esso gas station, go figure. Believe it or not I would be the first customer to buy a Leaf at the Moncton Nissan dealer, they have never sold an EV. They just installed a level 2 charger at the dealer. Thanks for sharing your adventure in a Leaf! Hi Rick. Ottawa now has four Nissan dealers that are certified to sell the Leaf. We purchased ours at Hunt Club Nissan and we do recommend it. I also know the folks at Tony Graham Nissan (Darren) and they do have a demo Leaf for test drives. I also saw a 2013 demo at Myers Nissan in Orleans. You can give them all a call and shop around. The only thing is that by November, I don’t think there will be any 2013 left in stock. Even today they are hard to find, and I don’t know when the 2014 will start to ship. You can definitely ask them. Many people buy the Leaf as 2nd car and realize that it quickly becomes their 1st car because they’re so much cheaper to drive (and more fun! to drive). Hi Ricardo, I’d love to meet with you when I’m in Ottawa. I’ll be in the New Barhaven area visiting family on the 6th or 7th of Nov until the 11th Nov. I’ve got EV envy. Only 22 months left on our Honda lease but whose counting! Hey Dave. I’ve been following your blog for quite a while. I do remember reading the articles about your heated jacket. Thanks for dropping by! Thanks so much for the details. Looking at buying a Leaf (or Tesla if we’re feeling particularly devoted/silly) for use in Moose Jaw, SK and your ‘research’ is invaluable! Hi there, we received delivery of our 2013 Leaf in September and, since then, we have been enjoying noting how it adapts to the cold weather (we are in Edmonton). This past weekend, when the temperature hit -17C, we noticed that the cabin heater stopped working. As far as we know, this is not a “feature.” Have you or any other Leaf owners you know experienced the same? Oh, further to that, this morning, the heater was working when the outside temperature was around freezing. SIGH. It should always work. I haven’t heard of anyone reporting problems. If you think it isn’t working, take it to the dealer and they’ll fix it. I was considering an electric car and this did come up. What fascinating data you guys have on this. Thanks a lot. I’m sure someone’s going to put a fancy infographic together with the data set. Also, I’m betting these numbers will improve as technology in this side of the automotive industry evolves faster and faster. Hey really great post on your data regarding temperature vs. range. I appreciate you doing the testing with normal use and limited cabin heat scenarios. It makes perfect sense, of course, that range will be hit more by cabin heating than anything else. I spent many years living in Ottawa so I know what winter can be like. In Toronto I find the winters are not nearly as bad, usually we get down to -10 on the colder days, and rarely below that. Nice to see that range is pretty flattish even down to zero. So most normal days your range is not an issue. I totally agree with one of the conclusions you wrote on another post: If you are a two car family it is a total no brainer to own an EV. Especially when Ontario kicks in $8500. Heck, I could own a Leaf for an effective cost of $26k, and it would certainly pay for itself inside of a decade with average driving. Possible topics for you to write on going forward: How does the car perform in snow and ice with winter tires? Have you talked to any Model S drivers in Ottawa or elsewhere and compared the winter experience? Does the fall off in range at high temperature relate to air conditioning use? What do you think of the cost of ownership versus and ICE-powered similar quality sedan or hatchback? Hi Chris. Thanks for the feedback and for the suggestions. Lots to write about. With superchargers coming up between Windsor and Quebec City, and to the South all the way to Florida, if you can afford a Tesla, there’s really no reason to ever buy a gas car again. Do you have much hope that the 2014 SL’s would be able to get 120km total in -10C weather? My round trip commute is 110km’s total on a hwy ( wont hardly ever go over 90km/h as the hwy is a 2 lane with a lot of traffic and no stops. ). I plan on making arrangements on really cold days if I have to( using a gas van or car pooling at a friends house that is a bit out of the way but not much ) , but the saving’s for me would be amazing. I was all keyed up to get one but this last couple weeks of almost -20C temp’s is making me a bit nervous. ( I live in Southwestern Ontario London area ). So it’s really odd to have temperatures below -10C over the course of a year. Dave is right. There’s a slight range improvement compared to the 2011/12 but mostly due to a more efficient heater and regen, but it’s basically the same car as the 2013. As for your commute, you should be ok most of the year but not during the winter. I’ve driven 125 km on -10C but with minimal heating, just enough to keep the windows from fogging, and at city speeds. That is pretty much the limit at this temperature. The best bet for you would be to find a 120 V plug at work that you can use. It would change the picture completely. You could probably drive your Leaf every single day of the winter. Ask your employer, offer to pay for the electricity. All you need is a regular 120V outlet. If one is already available where you park, there’s no investment on their side as you can use the EVSE that comes with the car. That’s what I’ve been doing at work. Hi, Ottawa resident, Prius owner, and we are about to purchase a Leaf, if we can get one! Now I am thinking winter tires. Do you have anything on yours? I’d love your opinion. We will get the 2014 SL with 17″ tires, but I’d like to go down to 16″ with alloy wheels to save the “fuel” economy over steel rims. We’ve had michelin x ice on the Prius and a civic before that and we’ve been very happy with them, so I intend to do the same. Any thoughts for me? I couldn’t see winter tires specifically discussed in any of your posts. Thanks! Hey, welcome to the club! Hope you can get your Leaf soon. The tires we got were the Michelin X-ICE XI2 205/55R16. I believe there’s an XI3 model now. They’ve been working very well, no complaints. I can’t really tell how much economy you’ll get with a lighter set of wheels. 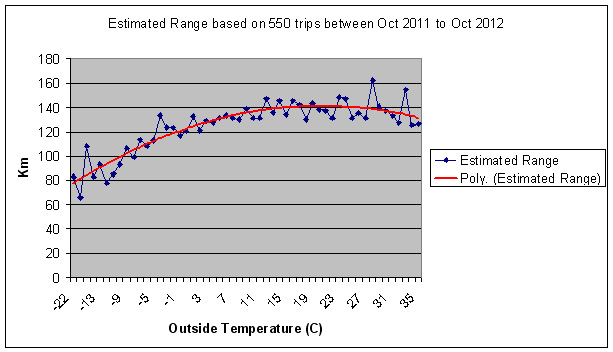 The toll of heater usage on the 2011 is so high that everything else gets lost in the noise. Maybe with the 2014 and its more efficient heater it will make more sense. Also, enjoy the faster charging time. That’s a big plus! Let us know how it goes. yeah x12 or x13 I don’t really mind, both will be excellent if they are new when we put them on the car! Thanks for the measurement, that’s awesome, pretty sure the body hasn’t changed since 2011 so good to know that size works. they recommended 215/50R17 for the 2014 SL. I am hoping to get away with just heated seats and steering wheel and leave the cabin heat off, and most of our drives are very short (like under 40k in a whole day) and if it is cold we are in big coats and kids are in snowsuits. During the day I park in doors (where there is a chargepoint charging station!) so we will see what is necessary. Your blog has been amazingly useful as we were considering the Leaf, thanks so much! Hi, this is Brian and Sherry from Hinton Alberta. We bought your leaf brand new in March of 2012 in Edmonton. Our leaf has been our primary vehicle for two and a half years now and we do not regret the purchase. The car has been performing as expected. We found that when we park the car in our unheated garage, and preheat the car through the carwings app, it gets a much better range then if we parked the car outside under the same treatment. I find that the wasted heat from the charging and the cabin preheating keeps our insulated garage much warmer than the outside temp.We live in a very mountainous area and we generally get 120 to 135 km range average in spring, summer and fall and no less than 80 km in dead of winter at temperatures of -33. Our commute to work is 26 km round trip so we use very little power from the traction battery as we preheat in the morning. Going home, we simply use the heating system and our heated seats and steering wheel as soon as we leave work. When we go shopping, we have a 45 to a 50 km round trip. We still own a 2008 prius as our long range vehicle . We have found that our electric car has been the vehicle of choice for about 98 percent of all of our drives . There is something to say about the instantaneous power , vary responsive driving experience and total silence of the car . Thumbs up to Nissan for making a vary high quality electric. After driving mostly highway, 33,000 kms on electrons, It make the internal combustion engine feel prehistoric , something from the past. Buying an electric car is a no brainer, as the fuel savings, low service costs, practically pays for the monthly payments on the car. We are still waiting on level two or even better, a level three public charging stations in our surrounding area. In the mean time, the car will have to stay close to home, except when we drive it once a year to edmonton 300 kms, for our yearly check up. Love your blog entries. I’m in the Moncton area and am looking to buy a used 2013 SV or SL for a decent price. I test drove a 2016 SV today and it was great but can’t afford the high payments. I asked the Nissan dealer to find me a used one but they don’t seem interested in doing that which is a big disappointment! I have a 20km round trip commute to work 5 days a week. Maxing at 60km city commute to go shopping and driving around for the day. I am concerned about battery depletion in the winter but this has given me hope that I will be fine if I were to preheat my vehicle. I was wondering if you could give me advice on where to look for a used 2013 SV or SL for around $20,000 or less so I could pay with cash. You can try Green Rock EVS (http://www.greenrockevs.com). That’s where we got my wife’s Volt in 2014. This dealer in Quebec also has several used Leafs in stock.